Contains: 11", 15-1/4" & 20" Pry Bars. Corrosion resistant nickel plate finish. 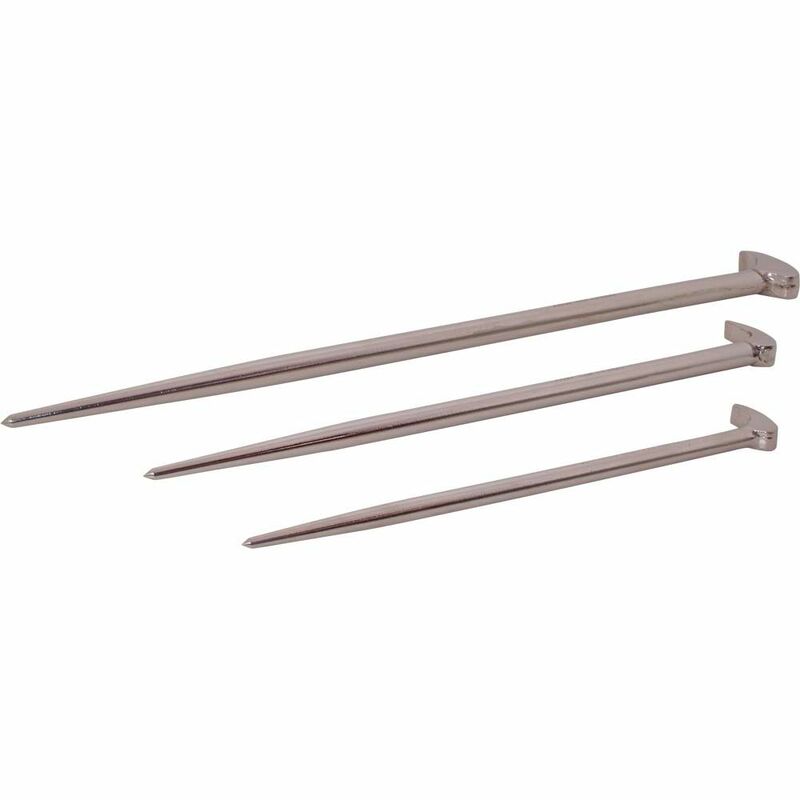 The ANVIL 3-Piece Pry Bar Set is well suited to a wide variety of prying and scraping applications. This bar kit includes three popular small bar styles that are perfect for do-it-yourselfers and pros alike. Designed in a compact size that fits just about anywhere, these bars work great for prying trim and moulding, scraping excess paint, opening paint cans and pulling nails. Professionals and DIYers can count on the new Bull Bar from Crescent for all their deck projects. Unlike similar tools, the innovative 180 indexing head changes positions, allowing the user to easily select the best angle for maximum leverage and access. The Bull Bar has a double fork design with teeth that grip the edge of the board, decreasing slippage and providing a balanced lift on both sides of the nail. Closed positions offer fast action for shorter pulls. Open positions allow for powerful downward force on large planks and are an ideal solution for ground-level work. Additionally, a robust center nail puller will remove ring shank nails and stubborn long nails with better balance and increased leverage. 15 inch Flat pry bar - All-purpose bar useful for pulling nails, prying and scraping wood. Beveled ends to avoid surface damage. Made of forged and tempered steel. Perfect for any job needing little leverage and for hard-to-reach places. Used to open crates and boxes. Remodeling slot nail remover on one end. 7 inch All-purpose flat pry bar. Makes pulling nails, prying, lifting and scraping easier. Beveled ends reducing material damage. Made of forged and tempered steel . Ideal for precision work needing some leverage. 3 Piece Rolling Head Pry Bar Set, Nickel Plated Finish The pry bars in this 3 piece set are specially heat-treated for maximum durability. It is forged from premium alloy steel and features a corrosion resistant nickel plate finish. Made in Canada and backed by Gray Tools worry-free lifetime warranty.